CINCINNATI, Nov. 19, 2018 /PRNewswire/ -- The Kroger Co. (NYSE: KR), America's largest grocery retailer, and Ocado (LSE: OCDO), one of the world's largest dedicated online grocery retailers, today announced the Cincinnati region as its selection for America's first customer fulfillment center (CFC). "Kroger is joining with the best partners in the world to co-innovate and leverage technology to redefine the customer experience," said Rodney McMullen, Kroger's chairman and CEO. "We are incredibly excited to partner with Ocado to transform the industry and deliver on our Restock Kroger vision to serve America through food inspiration and uplift. This Kroger shed, powered by Ocado, will accelerate our ability to provide customers with anything, anytime and anywhere." Kroger's first CFC – an automated warehouse facility with digital and robotic capabilities, also known as a "shed" – will be constructed in Monroe, OH, a suburb north of Cincinnati, subject to securing state and local incentives. The CFC model will be replicated to serve customers across America. Kroger is planning to open 20 CFCs to support its seamless vision. The CFC will introduce innovative robotics technology, allowing for next-generation automated storage and retrieval. Kroger is investing $55 million to build the first shed, which will measure 335,000 square feet and is expected to generate more than 410 new jobs. "We and our partners at REDI Cincinnati are excited Kroger has chosen Ohio for its first customer fulfilment center in the United States," said Dana Saucier, JobsOhio vice president and head of economic development. "This cutting-edge facility will bring 410 jobs to Cincinnati and serve as a national model as Kroger continues its focus on the evolving preferences of its customers throughout the country." "With its latest investment in the region, Kroger continues to be both an innovative leader in consumer goods and an essential part of Greater Cincinnati's growth," said Kimm Lauterbach, President and CEO of REDI Cincinnati. "REDI Cincinnati is excited to support Kroger's growth in Monroe." "Kroger is committed to helping position Cincinnati and Ohio as a destination for digital and technology talent. We are proud to choose our HQ state of Ohio as the first location for this first-of-its-kind customer fulfillment center in the U.S.," said Mr. McMullen. "We thank Governor John Kasich, JobsOhio, and REDI for enabling Kroger's $55 million capital investment and creation of 410 new Ohio jobs." Earlier this year, Kroger and Ocado announced an alliance to bring to the U.S. Ocado's unparalleled innovation and technologies. In October, the companies signed a master services agreement to further solidify their partnership. "Ocado is a UK-based company with global ties and advanced digital and robotic capabilities. Working together, we will develop the strongest possible supply network to support a seamless customer experience that can serve every person in America," said Alex Tosolini, Kroger's senior vice president of new business development. "It's all about building a seamless supply chain to provide our customers with an amazing shopping experience." "We are delighted to be supporting Kroger in its efforts to transform the service and value it brings to U.S. customers," said Luke Jensen, CEO of Ocado Solutions. "Today's announcement of the first CFC is an important first step to making that happen. It's all the more exciting that this CFC will serve Kroger's hometown of Cincinnati." To view video and photography of a CFC, visit here. At The Kroger Co. (NYSE: KR), we are dedicated to our Purpose: to Feed the Human Spirit™. We are nearly half a million associates who serve nine million customers daily through a seamless digital shopping experience and 2,800 retail food stores under a variety of banner names, serving America through food inspiration and uplift, and creating #ZeroHungerZeroWaste communities by 2025. To learn more about us, visit our newsroom and investor relations site. Ocado is a UK based company admitted to trading on the London Stock Exchange (Ticker OCDO). It comprises one of the world's largest dedicated online grocery retailers, operating its own grocery and general merchandise retail businesses under Ocado.com and other specialist shop banners, together with its Solutions division. Ocado Solutions is responsible for corporate partnering, which began with its agreement to operate the online business of Wm Morrison Supermarkets plc in the UK, and more recently with agreements with Groupe Casino, Sobeys and ICA Group to develop their online businesses in France, Canada and Sweden respectively. The agreement with Kroger to provide it with the OSP suite of products to massively expand its online grocery business in the USA is Ocado Solutions' largest and most recent partnership transaction. OSP is an enabling platform provided as a service to retailers. 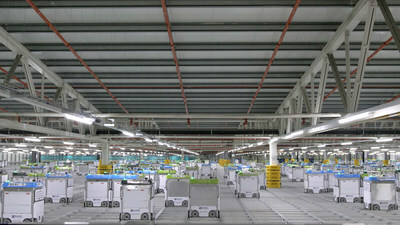 It comprises access to Ocado's physical infrastructure solutions to run highly efficient warehouse operations for the single pick of products, together with the entire end-to-end proprietary software applications required to operate an online grocery business - from user interfaces, through warehouse operating and control systems, to logistics, route planning and optimization. It is underpinned by Ocado's expertise and experience as a dedicated online grocery operator in the UK.